So I've been working on and off trying to get the Kindle weather display to work properly between a web server and the Kindle. This morning at around 12:15 am I finally got everything working properly. step 5: Kindle looks at the web server. If the png file is available, display it. The whole thing has been a fantastic exercise. While I didn't create the graphics or write the python script (I can't code in python, but I'm certainly teaching myself because it looks fascinating), I've learned enough along the way to know how to tweak things and see a potential for changes and future projects. In fact, the first thing was to add a date. 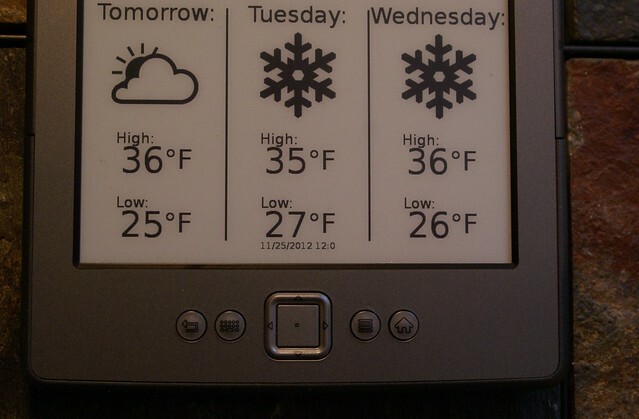 The Kindle Weather Display as created by Matthew Petroff doesn't include a date. If you trust everything you're doing and you're looking for the cleanest possible display, there'd be no reason to clutter it with a date. I don't trust me and I wanted a date. Chris helped me work out placement with the date since he has more experience working with SVG files. We added a small line (called DATE_VALPLACE) in the weather-script-preprocess.svg file. 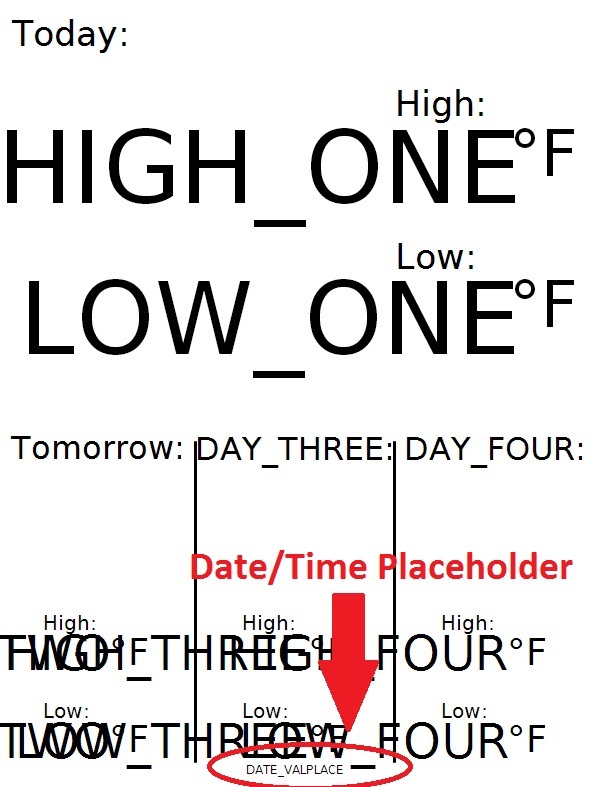 This creates a place holder for date and time. The whole thing is only 12 pixels high so it's very small, as you can see. 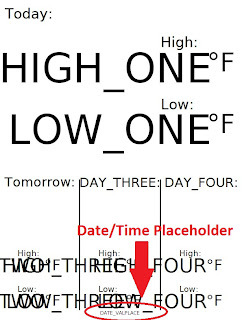 To accommodate the space for the date, we did shrink down the size of the high and low temperature displays on the bottom row (to 48px from 58) and move them up slightly (about 10 points on the y axis). After that just a few lines had to be added to the python script to actually calculate the date and time. Now we have a weather display that shows the date and time of the last update. 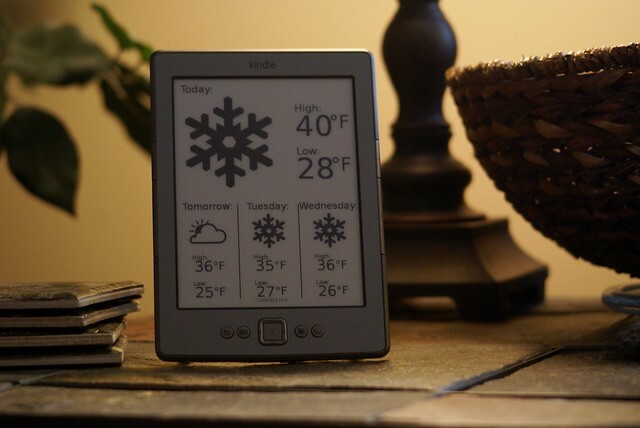 If this is something you're interested in setting up, I'd recommend reading the original Kindle Weather Display blogpost and downloading the files Matthew Petroff has available. Because I didn't already have a web server running I used this as an exercise to learn more about both Linux web servers and general Kindle hacking. I've listed the steps I took below. Here are the modified files on github or if, if you prefer, dropbox. These are what I'm using to run the display with date and time on my Raspberry Pi server. I'd also recommend knowledge working in the linux command line and working with vi editor. Kite is an application launcher that allows you to launch apps from the Kindle home screen. This is what will be used to launch the weather display on the Kindle. NOTE: once this is running, you cannot exit it. The Kindle will need to be rebooted to get back into the menu. To reboot the kindle hold the power button for 20 seconds. There have been posts about people unable to install from the update .bin file on the Kindle 4 so I used "installation of kite as script" which was the kite.gz download. Kite should now be installed. When you restart your kindle you will see a kite pdf (delete me). Simply delete the file. Create a folder called ondrop within the kite folder. If you have not registered the Kindle with Amazon, it will probably not be displaying the correct date. Ensuring that the clock is right (or that you are at least aware of the time on the Kindle) is crucial to scheduling cron jobs. Here’s how to change the time on the Kindle if you haven’t registered it with Amazon and downloaded the correct time. This is taken from this blogpost. If you're unfamiliar with cron, I recommend starting with here first. Your cron file will look like the above, minus the line highlighted in yellow. Simply add a line to run your script as often as you would like. In this example the display-weather.sh file is scheduled to run every 5 minutes. I used this interval for testing purposes to ensure the server and kindle were working properly and updating. NOTE: I DO NOT RECOMMENDED SETTING THIS TO A LOWER INTERVAL FOR TESTING PURPOSES. As soon as you restart cron (either rebooting the Kindle or from the command line) The display launches at the designated time. If you set this too low (for example 1 or 2 minutes) and reboot the kindle, you will be unable to access the cron and adjust the time. This is because a reboot causes you to lose access to SSH (requiring the ;debug command to be re-entered). If the script is set to run every minute or 2 minutes, that is likely not enough time for you to enter the command, SSH into the device, and edit cron. Now, my web server is set to pull the weather every 2 hours so I set the cron on the Kindle to update ever 2 hours at the 5 minute mark. That means the Kindle will now look for an update at 2:05, 4:05, 6:05, etc. That is a full 5 minutes after the server has pulled the weather and processed the data. the script will now run at the designated time. You can launch it manually from Kite on the home screen or wait for the interval to pass in cron and it will launch it automatically. You must have Python installed (version 2.7.3 will work. I have not tested the script in Python3). You will need rsvg-convert or imagemagick to convert the SVG file to PNG (the Kindle cannot read SVG files). You need pngcrush installed to compress the PNG file. If you use the file as provided on the Kindle Weather Display website, you will need version 1.7.22. Pngcrush should be available in your distro repository. If you're setting this up on a Raspberry Pi running Raspbian, as I have, there are a few extra notes to be aware of. Had to ensure full paths are included in the custom cronjob because it wouldn't run the weather-script.sh file properly. Modify the files so that they will work on the Kindle as a stand alone without the web server. 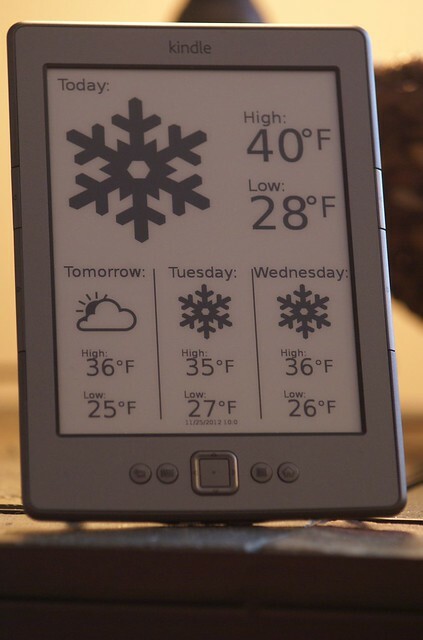 Similar to the Kobo Weather Display. I hope these notes help if you're looking to set one of these up. If you have any questions or something doesn't make sense, leave a comment or send me a tweet (@shatteredhaven) and I'll get back to you as soon as possible. Spectacular instructions, Jennifer!! Thanks for taking the time to write all that out! Thanks! I hope they were helpful! Hi do you have any advise how I may get this work with a UK location? I notice that when I change the Lat and Lon co-ordinates, the script errors out when calling the .PY script at line 43. Unfortunately, the python sript is looking at NOAA, which is just for North America. I believe you could swap the xml link for one from Wunderground, which should cover the UK for weather updates. Many thanks I'll give that a try. FYI librsvg2-bin is available in the debian repositories for rsvg. Great blog Jennifer. Liking the update time field, we think the same way! One thing i found on Debian, might be useful for others - is that pngcrush is a bit funny with the bit depth. I tried "pngcrush -bit_depth 8..." but it stretched the image. The solution was to do it in the svg conversion step with "convert -depth 8..."
Q: Any luck getting this project to work on the Kindle as a stand alone without the web server? How about just getting a date/time to show up in big fonts without a server call? Thanks again for the great blog post. Fabian - I do not believe there is a way to get this to work strictly on the Kindle. So far as I know, the Kindle doesn't have the ability to run the necessary software to convert an SVG, create output, etc. Even if you removed the images and went strictly text, the Kindle wouldn't be able to run the necessary python script. You might have better luck with the Kobo. I *think* you can actually load Python directly on it, so you might have more success with that. I'm trying to download/install your dropbox 'Kindle Weather Display.rar' to my Raspberry Pi. I tried installing unrar-free but it apparently does not handle your .rar because it has multiple files within. Is there some reason to use .rar vs. something more common like .zip or .gz? Does that mean I have to load kite some other way? Or will Kite just not work for my Kindle 4? Is there some other way to run shell scripts on a jailbroken kindle?